Contributor Pasquale Josepe created this beautiful aerial tour of Los Cabos, at the southern tip of Mexico's Baja Peninsula. 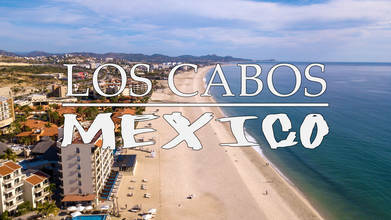 Los Cabos is a municipality which was essentially created for tourism. It includes the resort towns of Cabo San Lucas and San José del Cabo. While the latter town is centuries old, the area only came into its own in the late 20th century, when the Mexican Government decided to create a tourist zone similar to the area around Cancun on the Yucatan Peninsula.